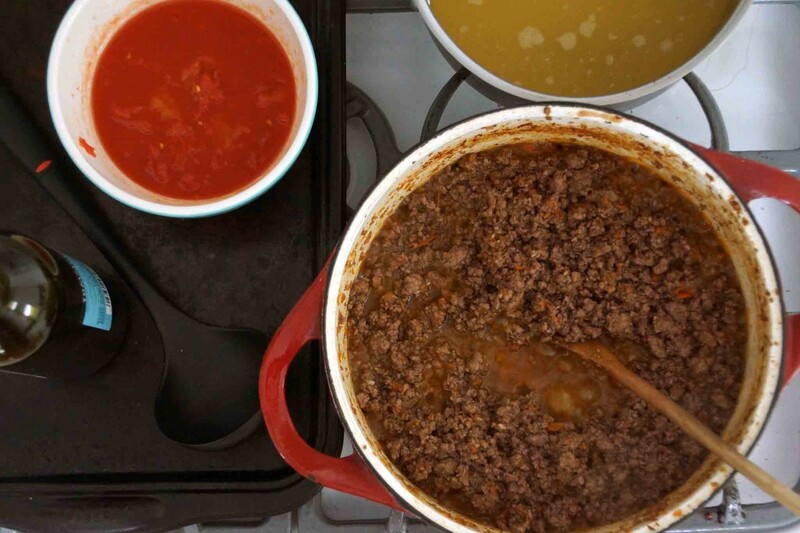 Bolognese sauce ranks pretty high on my list of favorite things to cook in the dead of winter. It’s the ultimate comfort food–hearty, homey, and warming. Plus, it requires you to spend a slow-paced afternoon in a toasty kitchen with an open bottle of wine. What more could you ask for? 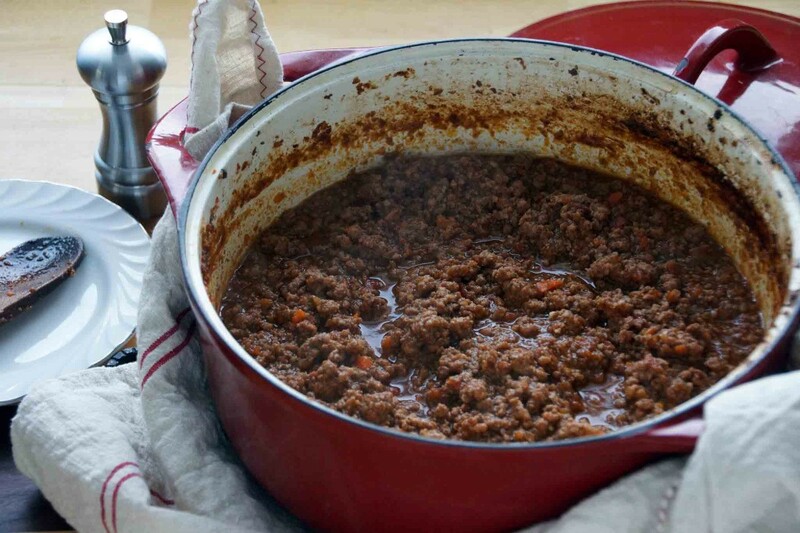 This recipe makes a big batch of Bolognese sauce that will keep you warm for several winter nights. It’s a combination of beef, pork, and veal that is slowly simmered with wine and tomatoes until it becomes unbelievably rich and luxurious. I used half of the batch in the lasagna I served on Christmas Eve and there are 2 small containers of it squirreled away in the freezer that will dress pasta or top polenta some time later this month when I’m snowed in and need nourishment. Okay, settle in and get cozy. I suggest fuzzy slippers and a sweater. Music. A book or magazine for the lulls between steps is a must. Gather up your ingredients. You’ll need lots of ground meat. I like to use the “meatloaf” mix my grocery store carries–equal parts beef, veal, and pork. And, as if that’s not enough, you’ll need a few strips of bacon or pancetta to get the sauce started. Onions, carrots, celery, and garlic. Tomato paste and a can of plum tomatoes. Stock. Red wine and white wine. For an even more sumptuous experience, Bolognese sauce can be made with milk instead of the wine; because I was making mine to go in lasagna with béchamel and cheese, I went for the “lighter” version. I like to prep everything before I start cooking so I can feel like I’m the star of my own cooking show, casually adding little bowls of this and that to the pan as I chat with my adoring audience…um, I mean my dog that is desperately hoping I’ll drop some meat on the floor. Massage some white wine into the ground meats, breaking it up into small pieces with your fingertips. Using the food processor, puree the bacon and garlic into a paste, then transfer to a bowl. Now pulse the carrots, celery, and onion into fine pieces. Plop the tomatoes into a bowl and crush them with your hands. Grab your Dutch oven and you’re ready to get cooking. First get the bacon and garlic paste going. Bacon? Garlic? In 1 pan? Yes, it will smell awfully good. When most of the fat has rendered out of the bacon, add the minced vegetables and sweat them down for a couple of minutes. 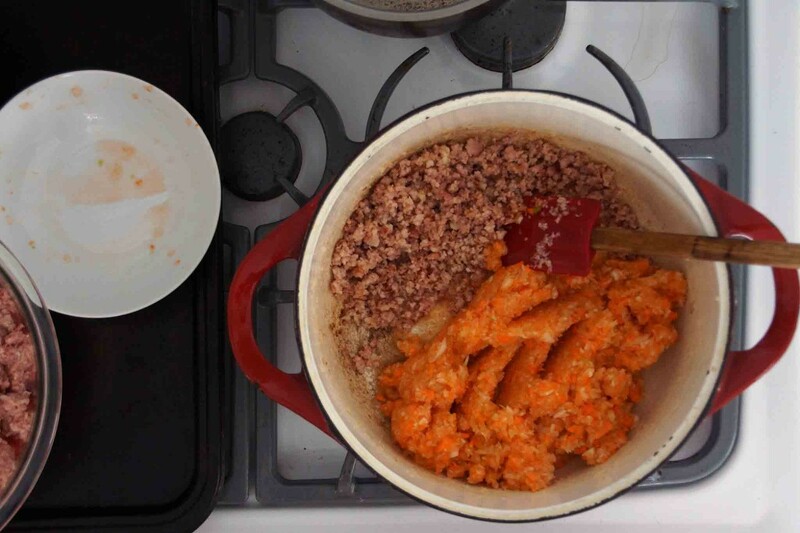 After the carrot mixture has cooked for a few minutes, go ahead and add all of the ground meat. Brown the meat, breaking it up into small pieces and tossing it with the sautéed vegetables as you go. The meat will start get very juicy–remember all that wine you dumped over it? Let the pot bubble away until most of the liquid has cooked off. Now we’ll add a few dabs of tomato paste and toss it with the meat. Pour in half of a bottle of red wine, let the meat absorb its goodness. Add the crushed tomatoes and let the meat drink them up, too. From here on out, we’re just going to repeat the same process. We’ll lower the heat to maintain a slow, steady simmer. Add a couple of ladles of hot broth to the pot and let the meat slowly absorb it. Repeat over the next 3 hours until the meat is tender and velvety and enveloped in a deep, intense sauce. Skim the fat from the surface and give it a taste. Good? I thought you might think so. Now you’re ready to dress a pot of pasta, top a bowl of polenta, or layer it between sheets of homemade spinach pasta to make an exceptional pan of lasagna. Stay tuned. 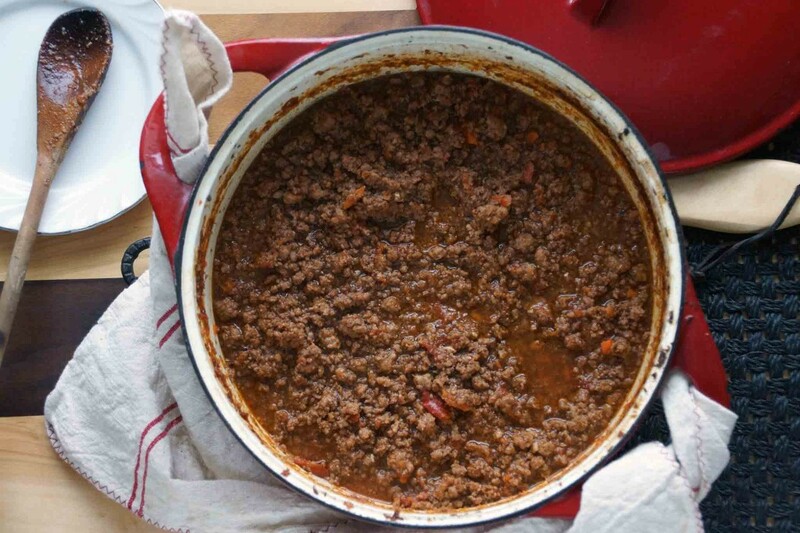 Good Bolognese sauce is one of winter's greatest pleasures. It is an essential component of from-scratch lasagna and is delicious with homemade pasta or over a bowl of polenta. This is a large batch, but because making it is such a time commitment, I like to make more than I need and keep some in the freezer. 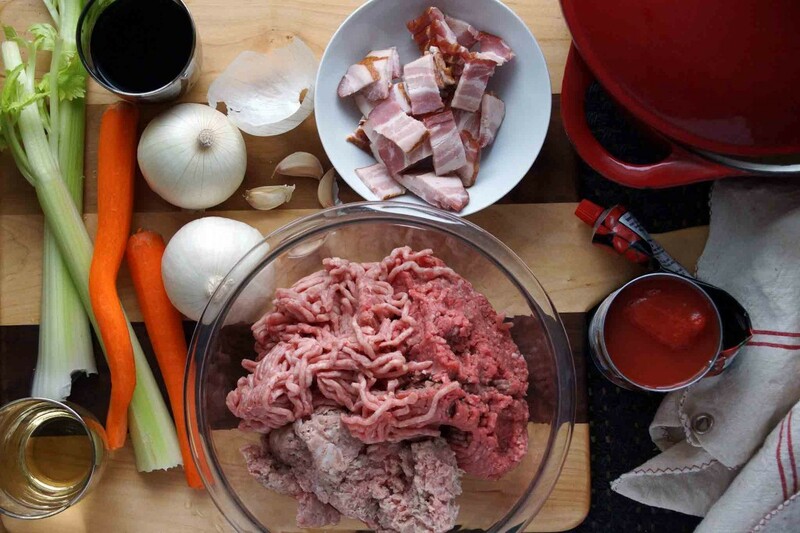 Combine the ground beef, pork, and veal in a medium bowl. Pour the white wine over the meat and, using your fingertips, work it into the meat. Set aside. 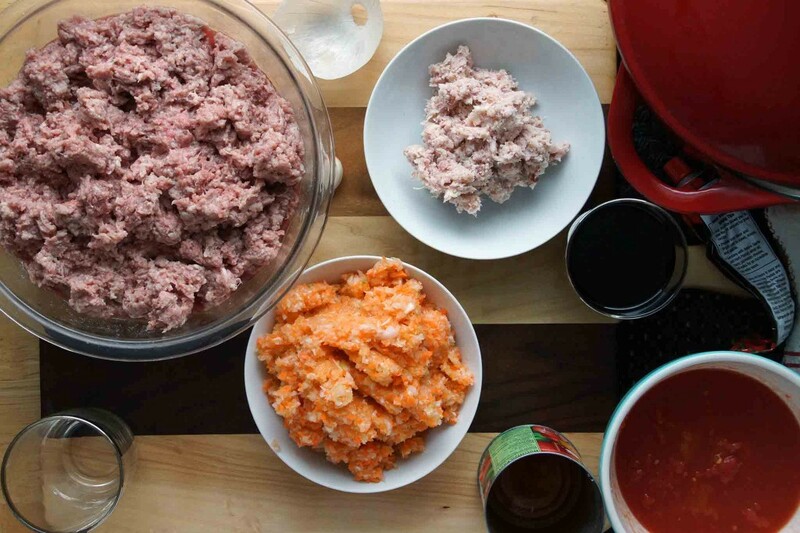 Combine the bacon and garlic in the bowl of a food processor and and process into a paste. Transfer to a small bowl and set aside. Cut the onions, celery, and carrot into chunks and combine in the bowl of the food processor. Pulse until the vegetables are finely minced, scraping the sides and bottom of the bowl as needed. Set aside. Place the bacon and garlic paste in a Dutch oven or heavy-bottomed saucepan over medium-high heat. Stir it with a wooden spoon as the fat renders from the bacon and the garlic becomes fragrant, about 3 minutes. If the bacon starts to stick to the bottom of the pan, add a drizzle of olive oil. Add the minced vegetables to the bacon mixture and bump the heat up to high. Sauté the vegetables until they have wilted and taken on a little color, about 5 minutes. As you do this, scrape up any little bits that might be stuck to the bottom of the pot. Push the vegetable and bacon mixture to the side, creating as large of an empty spot as possible, and add the meat. Season the meat with about ½ tsp. kosher salt and brown it, breaking up any clumps that start to form and making sure nothing is sticking to the bottom of the pan. Stir the vegetables into the browned meat as you go. The meat will throw off a lot of juice and fat to the point of almost being covered in liquid. Keep cooking, stirring often, until all of the liquid has cooked off, about 30 minutes. As the liquid level drops, lower the heat so the bottom of the pot won't burn. Meanwhile, heat the chicken stock in a saucepan. We'll be adding it to the sauce in small increments; you'll want to keep it warm so the temperature of the sauce doesn't drop every time you make an addition. Keep it on the back burner, over low heat. Now that the liquid has cooked off of the meat, clear a small spot in the bottom of the pan and add the tomato paste. Allow the tomato paste to cook by itself for a minute or 2, then stir it into the meat. Add the red wine, increase the heat, and bring to a boil. Cook off the wine, then add the crushed tomatoes. Again, let the liquid boil off. Add enough of the hot broth to cover the meat and adjust the heat to maintain a slow, steady simmer. Cover the pan. Simmer for about 3 hours, checking in on it every 15 minutes to half of an hour. As the liquid falls, add more broth, a cup or 2 at a time. When the sauce is through cooking, the meat and cooking liquid should be 1 cohesive unit (rather than meat floating in liquid). Skim the excess fat from the top. Taste. Season with freshly ground black pepper and additional salt, if needed. Use the sauce now or freeze it for later use. I made a Bolognese sauce this week as well! It was a perfect recipe to make while hibernating inside during this frigid Chicago weather. I made Marcella Hazan’s version and served greens on the side to balance out the richness if cooking with pancetta and milk. Your sauce looks so hearty and delicious! It’s so good this time of year! 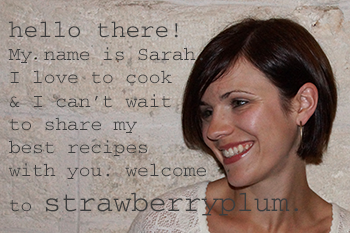 I checked out your blog and love that you’ll be focusing on Italian food–can’t wait to see what all you tackle! Can I ask why chicken stock, not beef? With the flavors of the 3 meats, wouldn’t the chicken add a fourth meat taste? Will try it but just curious. Looks amazing!